PLANNING DECISION RECOGNISES DAMAGE TO HISTORIC COUNTY SITE: LOCAL COUNCILLOR LEADS CAMPAIGN ON RETROSPECTIVE PLANNING APPLICATIONS. 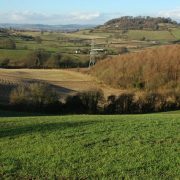 A retrospective planning application to Herefordshire Council – made by the developer after major earthworks at Dinedor Hill had threatened the landscape and conservation setting of a Scheduled Ancient Monument – has been turned down. Ward councillor David Summers of It’s Our County has worked for months with Dinedor Parish Council and local residents – supported by objections, including those from Herefordshire Council’s Archaeology advisor and national conservation body Historic England – to have the application refused. David has also led a campaign by It’s our County to tighten up regulations on retrospective applications where work has been done ‘under the radar’ before any granting of planning permission. “Dinedor Hill is an important national archaeological site, an ancient hill-fort and Roman encampment where excavations have thrown up Iron Age artefacts and Roman pottery. I want to thank planning officers for their continued support, and all those who made objections to this scheme. My concerns about retrospective planning applications are shared by many people. We all think it’s a loophole that needs to be closed, and this result sends out a good signal”, said Cllr Summers. “I will now be seeking full restoration of the land to its former condition”, he added.